Happy Thursday! Today I have a finished quilt to share, my Blockade Quilt! 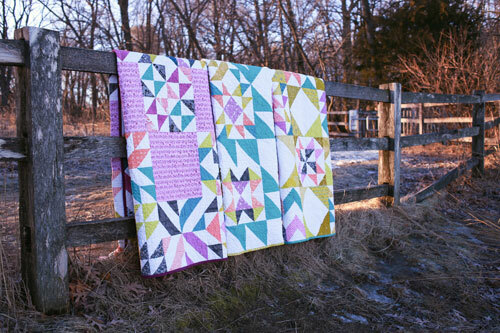 This past Fall and Summer, I went about finishing up the series of half-square triangle sampler quilt tops I made. 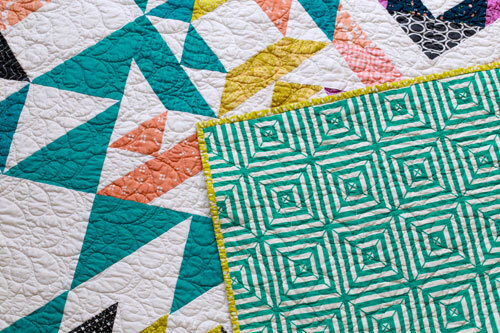 I took the 60 blocks from the block chart section of my book, Patchwork Essentials: The Half-Square Triangle, and put them together into three sampler quilts. I shared a setting tutorial for each quilt, and now I have them all finished up! Find the tutorials for all three settings here: Over and Above Quilt Setting Tutorial, Blockade Quilt Setting Tutorial, Interlaced Quilt Setting Tutorial. For each quilt, I focused on one of the colors that I used in the blocks. This quilt was focused around the color teal. I used a teal solid for the large half-square triangles along with more of the same white solid I used in the background of the blocks. 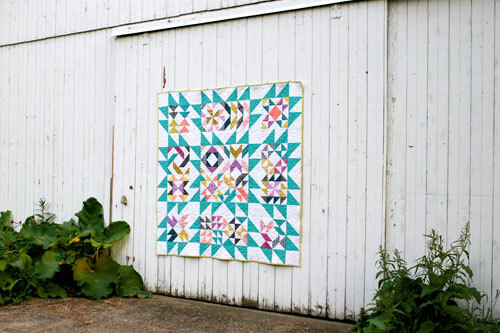 This quilt used 16 quilt blocks from the Block Chapter in my book. 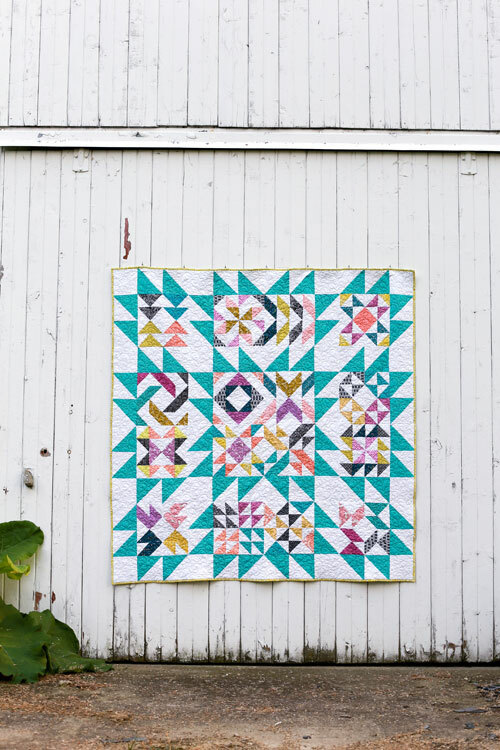 For more on the inspiration behind this quilt, head over to the tutorial post. 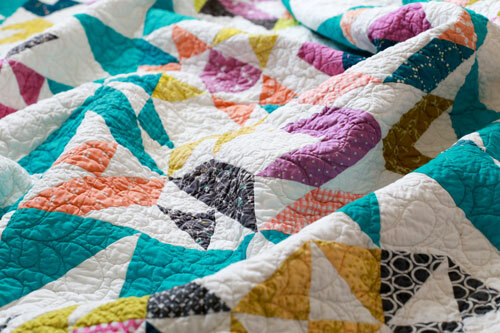 This quilt was quilted by Melissa Kelley of Sew Shabby Quilting. 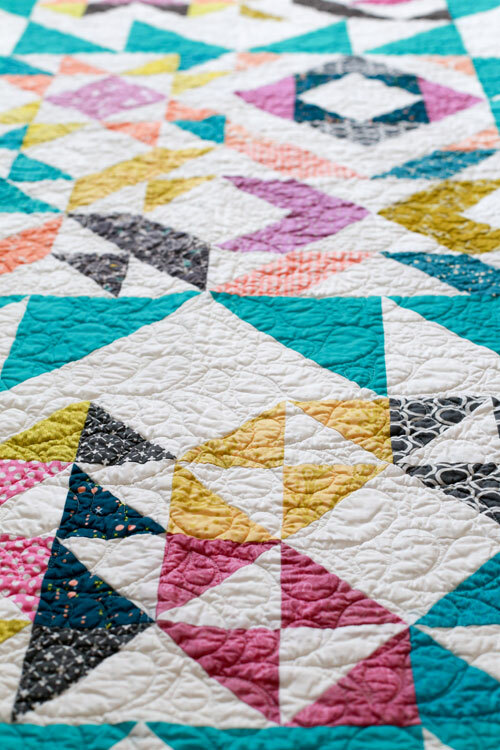 I love this feather quilting design, I think it was a great match for the quilt. It's still nice and soft and crinkly after a good wash and dry. For the back, I used yardage of this Minimalista by AGF Studio print from my stash. The color worked great with the front of the quilt and I've had it for a while. I finished it off with a citron green print from my stash for the binding. I never tire of green binding! 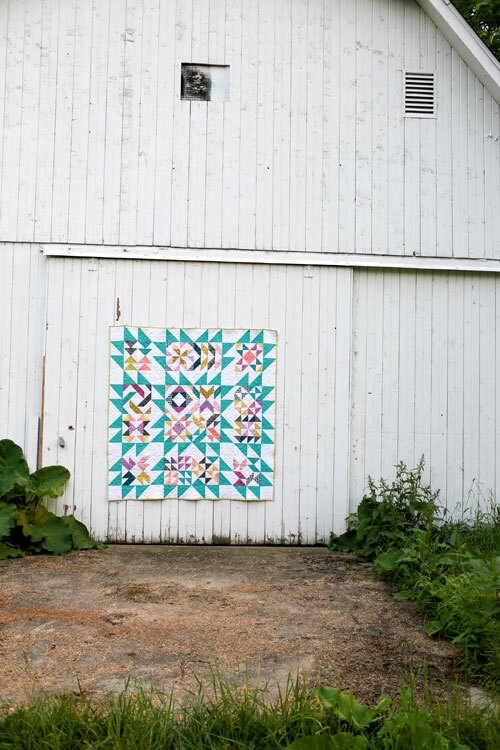 I have one more finished quilt from this series to share next month! That is a neat setting for your blocks! I have your book and love it. This particular quilt is so interesting to me. Thanks for showing it off. Wonderful! I love this one. So glad you finished it. I love the block placement and the colors so much! Beautiful quilt, Jeni! That's a really cool setting, and the teal really holds it all together. Nice job!